The Rummler & Brache model is comprised of three levels of performance; organizational, process and job/performer; and three performance dimensions; goals, design and management. This model forms nine variables in a structured manner, examining human performance in an organizational system. The organizational level should have clear strategic goals. The process level should have goals equal to the policies of the organization. The job/performer level, such as goals, objectives and standards should be in line with those at the process level. The three levels should work together in that performance at the job level would contribute to the outcome of the process level, and as a result contribute to the organizational accomplishments. 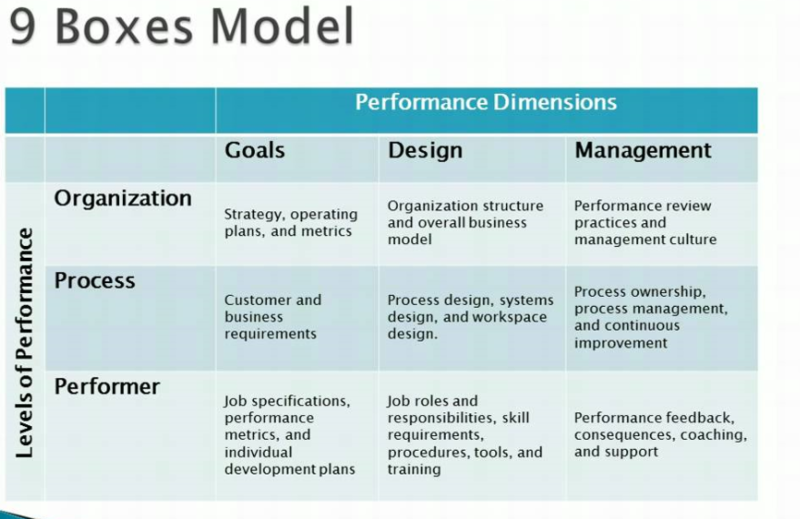 These three levels of performance and three dimensions are known as the nine boxes model.